As of November 2018, the Philips Sonicare DiamondClean has been removed from the Philips website as a ‘current’ product. The remaining stock that exists in stores and online commanding a premium price. On average the DiamondClean sold for £100-150. It is not yet clear whether there is a new version of the DiamondClean being launched. 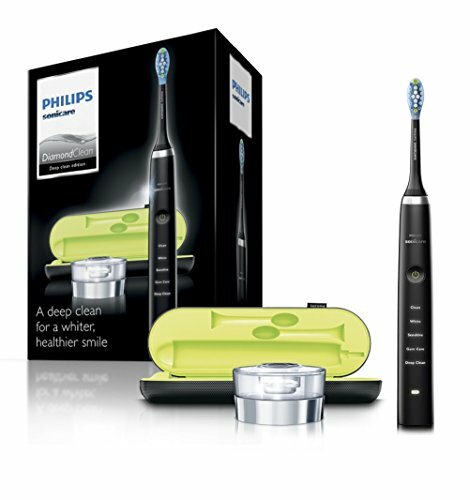 The suggested alternative is the Philips Sonicare ProtectiveClean 6100 (view on Amazon). For lots of detail on this product, please view our full review of ProtectiveClean 6100. If you are short of time, the answers to the following 3 questions should let you know all you need to about the Sonicare DiamondClean (view on Amazon) electric toothbrush. If we have missed something, let us know in the comments. If you want more detail, you can read the our full Sonicare DiamondClean review further down the page or watch our video review. No, far from it. It offers great performance and cleaning. Very good battery life, available in a range of colours, a smart travel case, but the minimalist design does work against it somewhat. We have given a rating of 4/5 to the DiamondClean. There are not that many brushes superior to the DiamondClean. 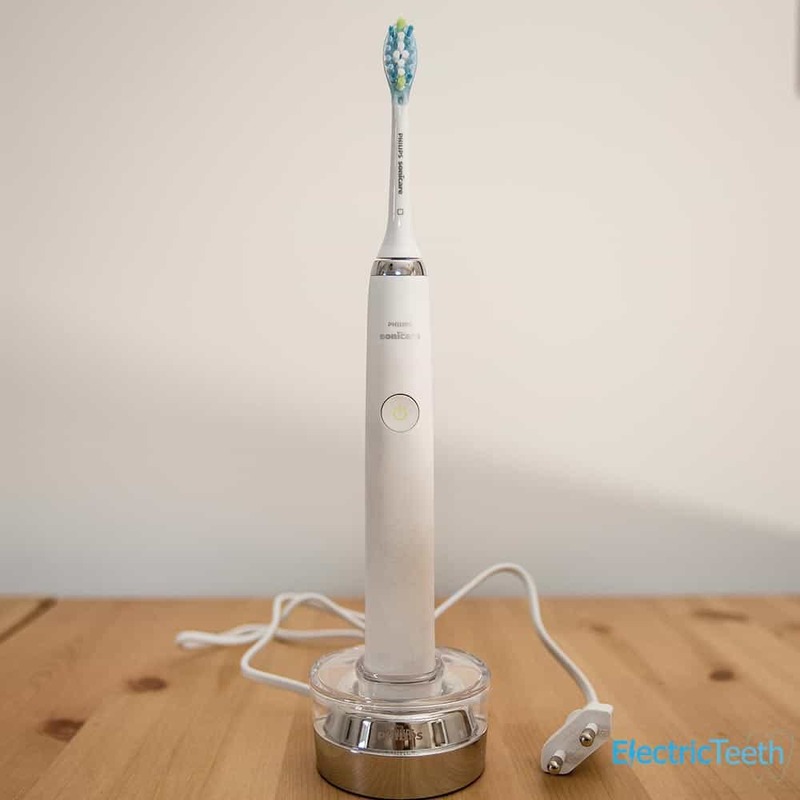 I will make the assumption that you are looking for a premium, feature-rich brush, which leads me to suggesting the Sonicare FlexCare Platinum Connected (view on Amazon) as well as the Oral-B Genius 9000 (view on Amazon) as other considerations. None are perfect, but they are all very good and available for similar money. 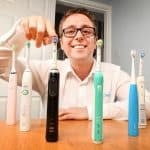 For a more complete comparison of the top brushes on the market, check out our list of the top 10 electric toothbrushes. 3. Where’s the best place to buy the DiamondClean? However, it’s always worth checking out other retailers as well. Check the links below for the cheapest price for the DiamondClean amongst UK retailers. It’s always worth checking eBay too. 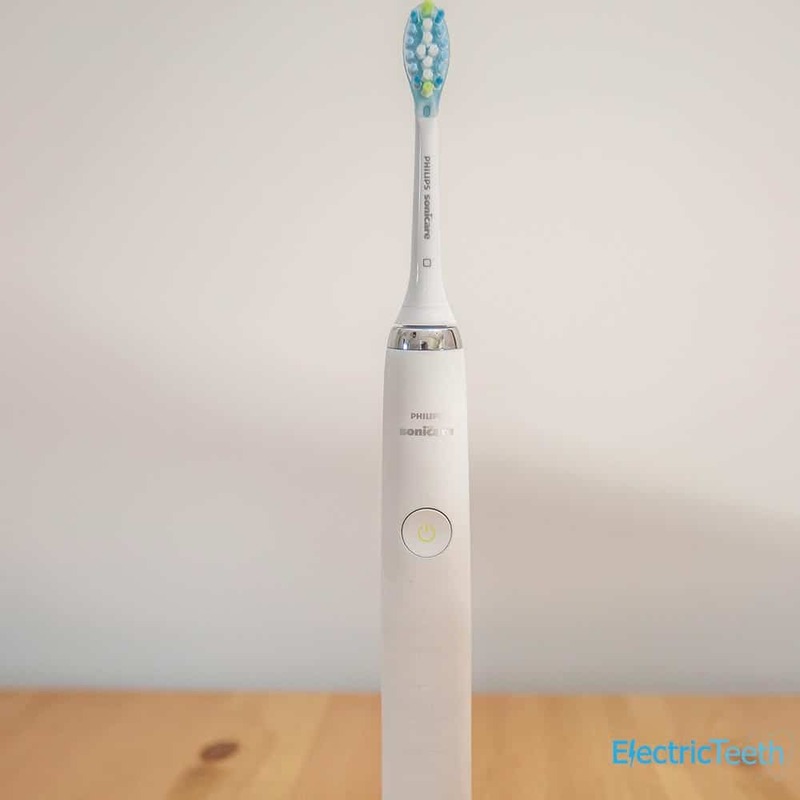 Currently, the DiamondClean is essentially the flagship electric toothbrush available from Sonicare. It is the brush that combines all the best cleaning modes with elegant design and box contents. An excellent brush, it is not faultless, but the strong cleaning performance, battery life and variety of colour options set this brush up to stand out from the competition. Apologies but this is about to get a bit confusing, but hopefully I can explain in a way that makes sense. The DiamondClean range has existed for a few years and at the end of 2016, an updated version was released. This 3rd generation model replaces the 2nd generation model that launched in late 2014. You can view the latest 3rd Gen version here on Amazon. You can view the 2nd Gen version here on Amazon. Over time the 2nd generation model will be phased out, with many larger retailers now selling only the newer model, but be aware that 2 models exist and you probably want to opt for the newer 3rd generation model; although you may likely pick up a good deal on the older 2nd generation box. What’s the difference between the 2nd and 3rd generation models? The 2nd gen model came with a charging glass, whereas the 3rd gen comes with a plastic charging stand (looks like glass). The 3rd gen works in a similar way but keeps the brush upright, whereas with the 2nd gen model the brush was tilted within the glass and other items could be put in the glass too. The provided brush head has changed. Despite the model name being ‘DiamondClean’ the 3rd generation brush actually comes supplied with an ‘AdaptiveClean’ brush head. Polish cleaning mode was available on the 2nd gen model, but this has been replaced with Deep Clean on the 2016 model. The Amethyst colour edition is not available in the 3rd generation. With both the 2nd and 3rd gen models, various colour options exist. Each one has a different model number, so it is probably worth knowing the difference. All being well you are now clear on the different models and how they compare. This review will focus primarily on the newest 2016/3rd generation model but will make reference to the 2nd generation for comparison sake and rounder explanation on the brush. Brush head – Engineered for really giving your teeth a good clean and achieving an oral healthcare routine that your dentist would be proud of. Design – The fairly slim profile looks great, but the cleaning modes are virtually impossible to read unless the brush is powered on and the brush is a little more slippery than some. Box contents – Whilst the box contents is not bad, it would have been nice to see some additional brush heads included. Charging stand – Now all plastic rather than glass. More practical but could be a better fit and design. Bluetooth – Arguably a gimmick for some, for a flagship brush I think it could have included it to ensure it is more in line with the competitors products. Sleek and stylish are just two words that I could use to describe this brush. I really like that this brush comes in an array of colour options, making it more appealing to a wider audience. It is a shame that the Amethyst colour option has not made its way to the latest generation, but hey it is nice to have the option of white, black, pink and rose gold. The white colour option is typically the most popular. Whilst the handles have more of a matte finish to them and are not exactly slippery in hand, there are no raised grips or textured surfaces at all. Running down the handle there is the Sonicare logo in a grey colour. Below this is the power button, which has a depression that the thumb fits comfortably into. It is not easy to accidentally press this, but does not take too much force to activate. These cleaning modes are lit when selected and the brush is running, as is the battery icon. With the power off you can hardly see these names in the handle at all. To access the different modes, you need to power on the brush and then press again, possibly multiple times to access the cleaning mode required. The brush will remember the last cleaning mode used, if the brush automatically powers off at the end of the cleaning cycle. So if deep clean was the last mode used and the brush turned itself off, when you next power it on, it will start on deep clean so you will not be required to five presses like you might if it was brand new and never before used. In principle this is good and the brush looks smart, but you have to actually power the brush on to see what cleaning mode it is on. So if you can’t remember what you last used, power it on to take a look, but remember to do this before adding toothpaste! I get the minimal look and design but for me this has gone past the point of practicality. Sorry I have to knock points off for Philips here. On other models they have another button to cycle through modes. I get the idea why, but I will take function over design in this instance. This is perhaps worsened, if like many the brush handle is shared between users. You constantly need to check and maybe cycle through the modes. The redeeming feature is that 5 cleaning modes makes this applicable for a wide array of users. The different cleaning modes, which we summarise below but explain in more detail here, last for differing amounts of time and deliver different frequencies and brush strokes to the teeth to deliver a different clean. 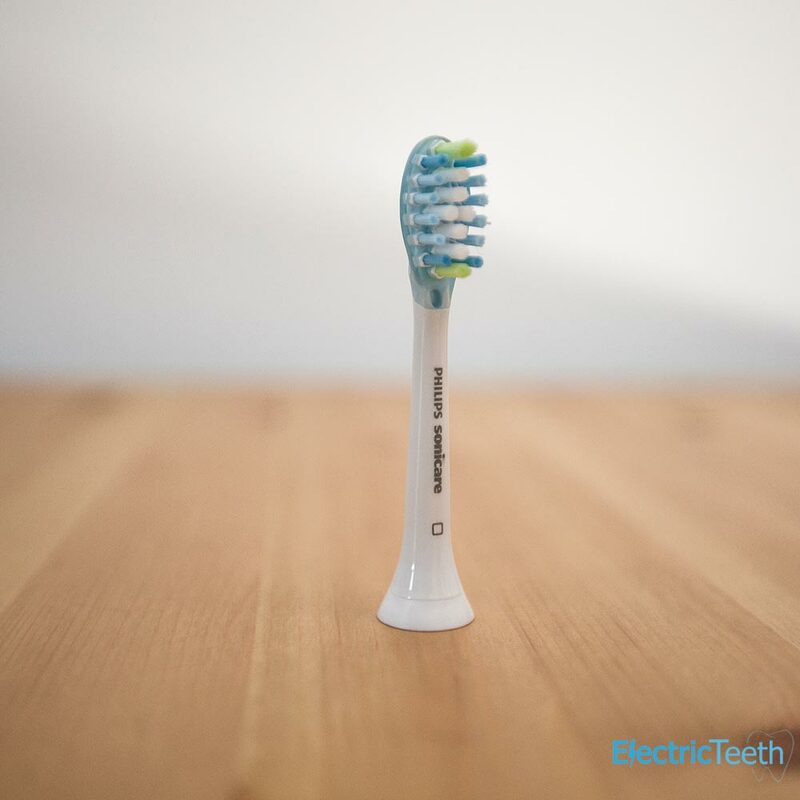 See full details in our guide on how to clean your teeth with an electric toothbrush, but as an overview: move the brush head slowly and gently across the teeth in a small back and forth motion so the longer bristles reach between your teeth. Do not scrub like a manual toothbrush. Apply light pressure to maximise Sonicare’s effectiveness and let the Sonicare do the brushing for you. Compared to a manual brush the DiamondClean with the provided AdaptiveClean head could remove up to 10 times more plaque and leave you with healthier gums in just two weeks. This brush has a quadpacer. This is an interval timer that beeps and briefly pauses to remind you to brush the 4 sections of your mouth. Depending on the brushing mode you have selected, the quadpacer beeps at different intervals during the brushing cycle. It is the timer, that at the end of the brushing cycle selected will turn the brush off to conserve power and alert you to the clean being complete. This brush offers up to 3 weeks battery life from the built in battery, but more on that later. The brush does a great job of cleaning and at no point did I feel the brush had done a poor job, my teeth felt clean and refreshed after each clean. Just sit this brush on the charging stand provided or in the case and the charge is transferred through this plate. At the top of the brush handle is the detachable and interchangeable brush head. Perhaps rather oddly, the DiamondClean brush now comes with a standard sized AdaptiveClean brush head with this 3rd generation model. The 2nd generation came with a DiamondClean head. I am not sure why Philips have changed this, possibly because the AdaptiveClean is a better allround head and does not focus primarily on whitening. The good news is that there are a range of brush heads available that are compatible with the DiamondClean handle. Any of these can be purchased separately. The pack size and the head size does differ depending on the one you opt for. There is the standard size and the compact option for the harder to reach areas of the mouth. With all the colour options, except black, a white coloured AdaptiveClean brush head is provided. With the black, you get in the box you get a colour matched AdaptiveClean brush head. This is great, but at the time of writing you cannot purchase the AdaptiveClean heads in black colour, so if you need to replace it, back to white. I guess they will be launched at some point as to date only the DiamondClean brush heads have a black colour option. So as nice as it is, if you want to keep the colour match you are somewhat limited. For more information see our complete guide on Sonicare replacement heads. Some users share a brush handle with family members or a partner for convenience and to extend the value. Given the various cleaning modes and specialised heads, it would be nice to include or have available some form of brush head storage compartment to allow storage. Third party options do exist. Another neat feature of this brush is the ‘Easy-Start’ option. Designed specifically for first time users, to help them ease into using an electric toothbrush. The Easy-start feature gradually increases the sonic power over the first 14 brushing sessions. Easy-start can be deactivated. To do so, just place the handle in the plugged-in charging base or charging travel case, then push and hold the on/off button for 2 seconds; 1 beep indicates the Easy-start feature has been deactivated; 2 beeps indicate the feature has been reactivated. With 21 days of battery life this slim profiled brush handle is really quite impressive, yet it comes with 2 charging solutions in the box. The first is a glass charging stand and the other is a travel case. I explain more about each of these in the ‘Battery’ section of the review below. The case is sort of colour matched to the brush, although the case with the white brush is silver and is a rigid construction with a soft touch material coating over the harder inner shell. This not only provides excellent protection to the brush handle and up to 2 brush heads, it also looks smart. It is not small, but then again you do not expect it to be. The case closes magnetically too, which is a nice touch. It is easy to open again so the magnets are not that strong. The brush can be charged in the case which is great and it can be connected to mains power or a USB socket on your computer or charger, must like a smartphone. It is a shame unlike a smartphone Sonicare stuck with a dated connector, more on that below too. 2 features that are in my opinion missing is a pressure sensor and Bluetooth connectivity. A pressure sensor is not that common on Sonicare brushes, but is on Oral-B. As the name implies if too much pressure is applied during cleaning a light is illuminated to alert you and you can reduce this so as not to do damage to the teeth. You soon learn, but the inclusion of such would help new users I think. To be fair the brush will make a straining sound if too much pressure is being used, but you need to listen out for that. Some brush handles include this and via an app available from the relevant app stores, your smartphone communicates with the brush to show you in real time, cleaning time, mode and performance and then logs this for future reference. For years we have done without the need for such, but as millennials adopt electric toothbrushes there is an expectation. Sonicare have actually overall probably done a better job of implementing it that Oral-B have, yet Oral-B have it on a lot more models than Philips. Only the Sonicare FlexCare Platinum Connected has it. Given this brush is competing with the Genius 9000, it is an omission that will favour Oral-B. So, overall it is pretty good going for the DiamondClean. With any Sonicare by Philips product I have used, the battery life has always been really impressive. In part the battery technology used has a part to play. The DiamondClean has a Lithium Ion battery, the same sort that you have in your smartphone. This type of battery lasts and performs better than older battery technology like Nickel Metal Hydride (NiMh). This brush can last up to 3 weeks on a full charge and if you only use the ‘clean’ mode twice a day for 2 minutes. The automatic power off facility helps conserve power, by turning the brush off at the end of each clean. My testing confirmed the advertised 3 weeks cleaning time. So that is some 84 minutes of cleaning time or 21 days based on 2 x 2 minute cleans each day. The charging stand it comes with is functional and could be taken with you when travelling as the 2 pin power connector supports 100-240v. 2 pin plugs are generally connected to the power supply found in a bathroom here in the UK. Some homes (mine included) are not equipped with such. It is possible to connect to a 3 pin socket by using an adapter. That said, the travel case with USB charging is a more appropriate item to take most of the time. With such great battery life you can even leave the power cable at home for the charging case on a two week holiday. On the subject of the travel case, in the box is a USB cable and 2 pin USB plug that accepts the USB cable and in turn connects to the same 2 pin socket the conventional charging stand does. I do not understand why on such a new brush the travel case still includes a MiniUSB connection rather than the more current MicroUSB or the really new and future proofed USB Type C connector. I guess convenience on Philips part has a big part to play here. It’s the same case as the 2nd gen model. What this ultimately means is that when you travel you need to take another cable with you because the MicroUSB, USB Type-C or Lightning connector charger for your smartphone does not work. Before first use you should charge the DiamondClean brush for 24 hours. The charge indicator flashes green until fully charged. Rapid yellow flashing indicates that the battery is low and that you have fewer than 3 uses left. After the first charge it does not have to be left on charge for as long, but leaving for 24 hours will ensure a full recharge of the battery. The DiamondClean model, unlike a lot of other Sonicare, Oral-B and Colgate models does away with a charging prong on the charging base. Normally a prong on the charging stand would fit into a recess on the bottom of the brush handle and not only hold the brush upright but deliver the charge. DiamondClean has used the same inductive charging process, but applied this to a flat surface. With the 2nd generation, a charging glass was provided. Designed to properly charge only one handle at a time, you could put the brush in the glass and it would lean within it. It acted more like a traditional cup/holder you might put a manual toothbrush into when not in use. This design made the holder a little better than the more conventional prong style design as if you knock the brush it would wobble in the glass and keep charging, whereas conventional chargers often sees the brush go toppling. Therefore its slightly odd that this 3rd generation is a mix of the two. No prong still but the glass has been replaced with plastic (to look like glass) and has been trimmed to an upright stand. The charging base has a gloss chrome plastic to look like metal, then the clear plastic top (made to look like glass) sits on top of that. The brush then sits in the recess in the clear plastic piece. From a distance it looks smart. However when you touch it the fit is not great and it feels much cheaper than all the other components. More practical and lighter, yes, but it is still prone to being knocked. That said the brush holds fairly well within this stand. Just a bit of a shame really. The glass felt so premium on the second generation. ‘Not cheap’ is how I will start this section of the review, but, it could be a lot worse. The recommended retail price of this brush is some £270, which is on par with the Oral-B Genius 9000. Now, these prices are rarely upheld and probably some 99% of the time the prices are 50% or less lower. This 3rd generation model cost us £121.50, that’s 55% less than the RRP. We’ve listed a live price comparison of UK retailers here. At this sort of price, this brush is more reasonable, even if still £80 more than a more basic brush. You don’t need me to tell you that every 3 months you need to replace the brush heads, so over 3 years we need to factor in the cost of 12 brush heads. 1 comes supplied in the box and the AdaptiveClean head is sold in packs of 4. The cost of purchase of this brush becomes £190.50 (£121.50 + (11 x £6.25)). Over 3 years this works out at a daily cost of 17p. When it comes to making the purchase, if this is the bruh for you, be sure to shop around and pay the price you are comfortable with and from a retailer you trust. Here at Electric Teeth to test the electric toothbrush in a way that you would use it at home. Only daily use for long periods of time will really tell how well a brush will stand up to repeated use and abuse. The fact that Philips have been producing electric toothbrushes and other consumer products for so long means that on the whole they know what they are doing. Typically their brushes are really reliable and rarely will you have a problem. If it does go wrong, it is backed by a 2 year warranty. Lab tests or durability tests are not something we do and it is not possible to test every toothbrush day in day out and report back on how they fare. However we take reliability seriously and always comment on where we think weaknesses are and should our opinion change as a result, we will issue an update to this review. 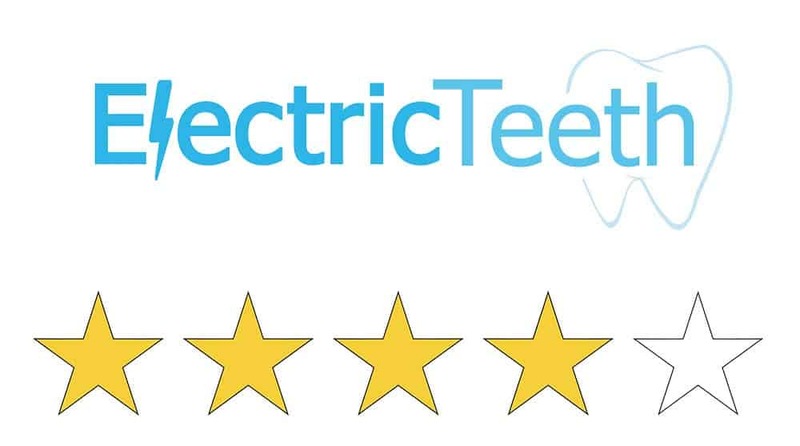 The DiamondClean electric toothbrush is overall a very good toothbrush. If you are looking for a place to buy, we recommend checking it out here on Amazon. It offers a lot and ultimately does a great job of cleaning your teeth. The battery life is super, the build quality is equally as good and the very functional travel case is desirable as is the range of colours it can be purchased in. Weaknesses explained in this review are primarily personal and you may feel different about them; but I do believe Philips missed an opportunity to make this brush that little bit better than they did, to really compete with the Genius 9000 from Oral-B. That said, if I had to pick between the two, the decision would be tough. I prefer the Oral-B for it’s features but I really admire the battery life and quieter motion of the Sonicare. The DiamondClean comes provided with one AdaptiveClean brush head. Sonicare do have a range of alternative brush heads that are compatible including, DiamondClean, ProResults, ProResults Gum Health, Sensitive and InterCare. Thanks for great dose of knowledge! I wonder if I can use 2nd generation charger (glass) with 3rd gen toothbrush? Hi Joanna, I see no reason why not!